What is an Fan Code of Conduct Class Certificate of Completion? Our Fan Conduct Class certificate of completion is used to show proof of completion of our Fan Conduct Class program for fans who were ejected from a venue for violating a teams or stadiums "code of conduct" policy. It comes on a standard form which includes both the customers relevant information as well as our identifying information and credentials. 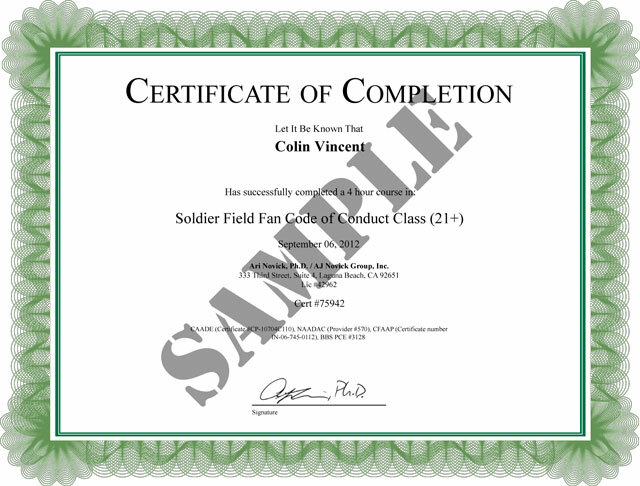 The certificate of completion of our Fan Conduct Class program is an important document because it shows your successful completion of our program and your requirement. You will have the ability to download and print (or save and email) your certificate. You will need to present this to security upon your next return to the venue.